A couple of years ago, a pair of video game developers received a deeply worrying email from the British Red Cross. “It has been brought to our attention that in your game ‘Prison Architect’ a red cross emblem is displayed on vehicles,” read the email. 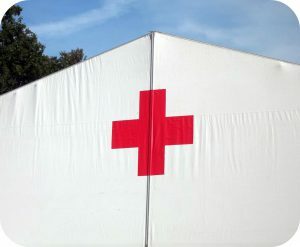 “Those responsible may be unaware that use of the red cross emblem is restricted under the Geneva Conventions for the Protection of War Victims.” Little did the two developers know, but their placement of a small red cross on the game’s ambulances technically violated one of the most important diplomatic agreements of the modern era. So while red cross symbols may appear occasionally in video games, they usually don’t stay there for too long. For instance, the game Halo: Combat Evolved used red cross designs on health packs until its developers received a similar message as the Prison Architect team. As a result, Halo 2’s health packs came stamped with a big red “H,” not a cross. The early 1990s shooter Doom also used red cross health packs that have since been changed in re-released versions of the game. But while the International Red Cross insists that its symbols “are not signs to be used for commercial purposes, such as for advertising campaigns or on products,” the red cross still pops up in all sorts of contexts. Besides video games, the symbol also appears frequently in movies, comic books, and even theatrical performances. This means that the Red Cross must constantly be on the lookout for creators and entrepreneurs who are unknowingly breaking international war crime laws by using the red cross. Why does the Red Cross maintain such strict control over the use of the red cross symbol? Do you think it is worthwhile for the Red Cross to dedicate some of its limited resources on policing the use of the red cross symbol? Why or why not? Source: Steven Messner, “How the Prison Architect Developers Broke the Geneva Conventions,” PC Gamer, January 16, 2017.